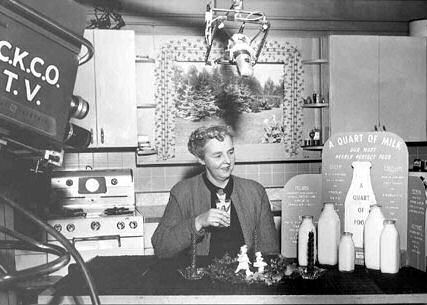 Vi Scriver, ‘Mrs S’ to her loyal audience, came to CKCO-TV from Robin Hood Flour Mills with a background in promotion and product demonstration. Her husband was killed in an industrial accident, so as a young widow and mother just into her 20s with minimal resources she literally ‘picked up her frying pan and gone on the road’. 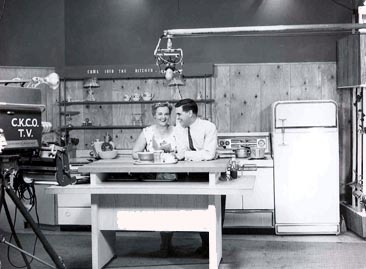 Recruited soon after Central Ontario began broadcasting, her daily live show, with first Tom Rafferty succeeded by Reg Sellner as kitchen-help, in a permanent set, was an early ratings builder for CKCO-TV, on air until it was cancelled in the mid-60s. With secretarial help, Mrs S provided write-in viewers with copies of her recipes, CKCO-TV eventually publishing a ‘Mrs S’ cook-book. Off air CKCO staffers remember Mrs S for her Christmas Eve open house – Mrs S stayed up all night Christmas Eve with an open invitation to her Neilson St. home in Waterloo for anyone on staff. When her show was cancelled, her family long since grown, Mrs S remained in the Kitchener-Waterloo area in a variety of jobs, one of the last before retiring as cook with the St Agatha Children’s Village. Now deceased, Mrs S was in her 90s at the time of her death.